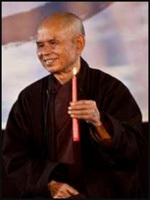 Nhat Hanh and the Plum Village sangha. walking meditation, tea and dharma sharing. © Gratia L. Meyer, Ph.D.